Wilson lives in Malawi, Africa. He is a Community Health Worker whose job requires him to travel great distances to connect communities to health care. Although Wilson lost his own family many years ago, he says "helping my community fight HIV/AIDS is my number 1 priority." He has been doing this work for over 10 years. Wilson used to walk at least 4 hours a day but with a new bicycle - provided by our Pedal Powered Hope project - he can reach more patients, provide more care, and save time for his family & farming. Choose one of our gift ideas below, from $25 to $450 CAD, to honour of that special someone in your life with your most thoughtful gift ever. All donations are tax-deductible and you will be issued a charitable receipt. Your gift of $25 allows us to outfit a bike donation with life-saving equipment: lights, bell and helmet. Your gift of $50 provides a bicycle to an individual living in an underserved Toronto Community. Your gift of $100 allows us to outfit each bike donation with safety equipment and a good lock. 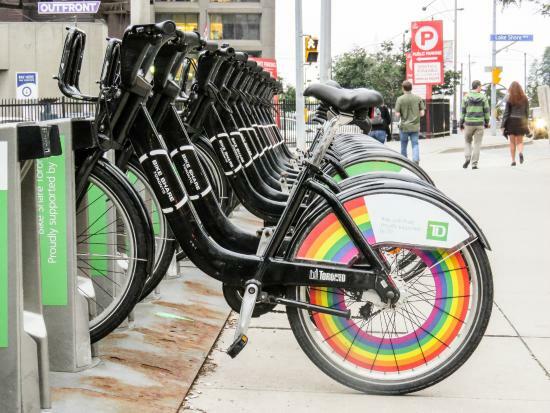 Your gift of $100 provides a Bikeshare membership for someone in Toronto who can't easily store a bicycle. Your gift of $450 provides a rural village with the means to access medical care in time to save lives. Your gift of $150 provides a new bicycle for someone in Africa and make sure it gets to them no matter where they live. YOUR DONATION ALLOWS US TO EMPOWER PEOPLE AND CREATE PARTNERSHIPS AROUND THE WORLD. BIKES WITHOUT BORDERS IS A REGISTERED CANADIAN CHARITY AND ISSUES TAX RECEIPTS VIA CANADAHELPS.